Biomedical, technological, and consumer product oriented applications of engineered nanomaterials is an expanding global phenomenon that is outpacing our scientific and quantitative understanding of potential toxicological consequences from nanomaterial exposure. This has hastened on an international scale the intensity of efforts to investigate the environmental and human health and safety risk from nanomaterial exposure. In 2001 the United States established the National Nanotechnology Initiative (NNI) program to coordinate National nanotechnology research. Since 2008 a key NNI focus has been on developing a National strategy for assessing nanotechnology-related environmental, health, and safety research. In March 2009 the European Union (EU) was the first in the world to establish strict regulatory guidelines imposing stringent workplace practices and requiring that nanomaterials be proven safe before used in products to prevent exposure to potentially toxic materials. Considerable challenges exist however, in the endeavor to quantify the safety of nanomaterials given their diversity in terms of size, shape, charge, composition, solubility, and the wide range of processes used to synthesize and incorporate them into products. There is an added challenge that nanomaterials maybe transformed upon contact with biological systems and in the environment. Overcoming these challenges is encumbered by the lack of sensitive analytical techniques to detect and quantify nanomaterials in biological matrices, the environment, and in the workplace. This has spurred efforts to develop standardized nanomaterials for use in toxicological testing as well as standardized methods to characterize their physicochemical properties. Again the EU is leading this charge as in February 2011 the European Commission's Joint Research Centre launched the first European repository of nanomaterials comprising of 25 nanomaterial standards. These can be used to investigate important questions as to which physicochemical properties most affect nanomaterial interactions with epithelial tissues, cytotoxicity, and transport through biological and environmental systems. Comprehensive documentation of results as presented in this book, “Toxic Effects of Nanomaterials”, is one important mechanism to communicate the status of this emerging field of Nanotoxicology for which few previous examples exist. A key feature of this book is inclusion of studies investigating potential toxicity of nanomaterial exposure to plants and aquatic life in the environment for which far less is known as the research community has focused mostly on assessing human health concerns particularly from skin and respiratory exposure. In summary, this timely book presents a state of the art view of all aspects of this complex Nanotoxicology field and is a contribution that will serve as a foundational guide in this field and the truth about the safety of nanomaterials evolves. This decade has seen revolutionary developments in the field of nanotechnology with newer and diverse applications of nanoparticles appearing everyday. Novel nanomaterials are emerging with different characteristics and compositions for specific applications such as cosmetics, drug delivery, imaging, electronic etc. However, little attention is being paid to understand, assess and manage the environmental impact and adverse effects of nanoparticles. Currently the information about the toxicity of nanoparticles and their environmental fate in air, water, soil and tissues is severely lacking. Inhalation, ingestion and dermal penetration are the potential exposure routes for nanoparticles whereas particle size, shape, surface area and surface chemistry collectively define the toxicity of nanoparticles. Several studies have shown excessive generation of reactive oxygen species as well as transient or persistent inflammation following exposure to various classes of nanoparticles. Increased production and intentional (sunscreens, drug-delivery, etc.) or unintentional (environmental, occupational, etc.) exposure to nanoparticles increases the possibilities of adverse health effects. Thus, the novel nanomaterials need to be biologically characterized for their health hazards to ensure risk-free and sustainable implementation of nanotechnology. Currently there are only a few books available in this specific area to cover toxicological aspects of nanoparticles. A reasonably priced, comprehensive book on nanotoxicology was therefore badly needed by the nanocommunity to clearly understand the subject and we tried fulfill their demand. The present book "Toxic Effects of Nanomaterials", comprised of 8 chapters with 77 illustrations (60 figures and 17 tables), provides an authoritative work of international experts in the field of nanotoxicology. The most important feature of the book is a broad coverage of phytotoxicity of nanoparticles, which is largely neglected in many texts. The first two chapters of this book deal with the toxicity of nanoparticles in plants. The third, fourth and fifth chapters discuss the toxicities of iron oxide, titanium oxide and silicon oxide nanoparticles. 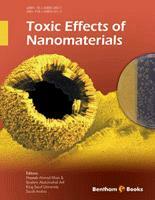 The sixth chapter provides a comprehensive review of methodologies used in nanotoxicology. The last two chapters highlight the risks associated with the use of nanoparticles and the environmental impact of nanomaterials. Such a broad coverage of nanotoxicology renders this book highly beneficial to the scientists from multidisciplinary areas including nanotechnologists, toxicologists, pharmacologists, environmental chemists and biomedical scientists. This book would equally be useful for the individuals advocating for sustainable use of nanotechnology. We are thankful to all the eminent scientists who have contributed their chapters to this book. The publishing platform provided by the Bentham Science Publishers is gratefully acknowledged.